In the face of challenges from the likes of Amazon, Waterstones success in returning to profit for the first time in seven years deserves immense praise. Earlier this week, however, it was revealed that the bookselling giant has opened three small unbranded stores in locations across England. Some have argued that in opening shops purporting to be “independent” without notifying consumers of the real owners, Waterstones has been underhand. Others have stressed that any effort that pushes books – whilst filling empty premises - is a positive thing for any town and its inhabitants. Waterstones itself stressed the need to act as an independent in order to enhance the high street. But would this approach work if it was rolled out more generally? Using YouGov Profiles to look at the opinions of regular book readers we find that they are more likely than the public in general to prefer shopping at local businesses (68% to 61%). 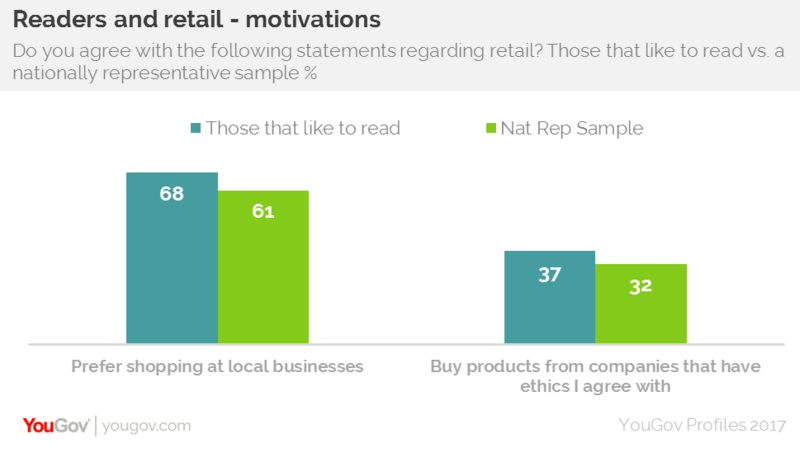 Additionally, with local, independent shops having a reputation for going about things in the “right way” regular readers are also more likely than the public overall to buy products from companies that have ethics and values that they agree with (37% to 32%). In this regard, opening up “independent” shops seems to be a good approach in meeting the brand’s core audience on their own terms. general brand perception is strong and so is unlikely to suffer much impact from the stories about its “independent” shops. Our brand tracking data shows healthy scores across many metrics among all respondents. Its 'overall impression' score has risen four points this year and is currently a very robust +47, which places it not too far behind the much loved John Lewis. In fact, Naturally those who enjoy reading rate Waterstones still higher, at +56. Consumers also think the chain sells high standard fare. Its Quality score (whether you think a brand represents good quality) is also impressive, currently standing at +41. Understanding the motivations and traits of your target market is key but so is making sure you communicate your approach effectively and in this case it may be that Waterstones miscalculated slightly. Nonetheless, Waterstones remains in a strong position, both with book lovers and the public more generally.